Envitech offers a range of optical Dissolved Oxygen monitors for process, wastewaters and natural watercourses. These Optical DO sensors are of an innovative design with No membranes or caps. This means No consumables costs, resulting in a lower cost of ownership. This type of sensor is simpler to maintain and is more robust because of the solid state technology. The range of instrumentation using this method includes fixed site and hand-held devices for use in many different applications. For your copy of a WRC study of the performance of the DO sensor click here. Insite IG produce a range of fixed-site analysers specifically designed for Water and Wastewater Treatment Plants. The latest generation of instrumentation from Insite can be connected with any of the range of Insite sensors. The range comprises a Single Channel transmitter, a Dual Channel transmitter and a Multi-Parameter transmitter capable of connecting to 8 sensors in total. 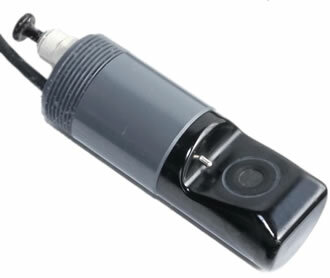 The Model 10 dissolved oxygen sensor utilises an optical technique that does not consume oxygen - giving a significant advantage compared with electrochemical sensors in slow moving waters. The resulting system gives unrivalled performance without any consumable costs whatsoever. Cleaning can be automated, meaning that servicing costs are kept to an absolute minimum. Periodic verification can easily be carried out on site using the hand-held unit (see below). The InsiteIG_3100 portable dissolved oxygen monitor has been superseded by the new IPM logger. The IPM is state of the art, and easy to use providing many benefits to the plant operations staff. Exactly the same technology as employed in the Fixed site analysers, is used in the hand-held equivalent. This portable instrument can be left dry in a carry case on a shelf. Once the battery is recharged, it will immediately be ready to be used again - no cell-refurbishment required, no need to keep the sensor wet. This new hand-held device can be used with an array of different sensors including Optical Dissolved Oxygen and Suspended Solids. The sensors are interchangeable and auto-recognised by the logging software. Click the links or the photo to see more details. The older versions (3100 and 3150) were discontinued at the end of 2018. MJK have added an optical dissolved oxygen measurement sensor to their range of analysers. This analyzer is a DO system which combines the benefits of the optical sensor with the flexibility and connectivity of the MJK converter. The specs for this system include accuracy of 1% or 0.02ppm, resolution of 0.02ppm and a range of 0-25ppm (temperature range 0-50degC). Co-operation between the sensor manufacturer and transmitter manufacturer has resulted in a powerful and cost-effective solution. The MJK transmitter can be supplied to run from conventional 115V or 230V mains, but also has 24VAC and 10-30VDC options. In addition, a factory-fitted PROFIBUS module option is also available. An additional feature of the MJK system is it's Digital Input which allows us to trigger cleaning 'on demand' as well as using integrated automatic timed cleaning (air compressor required).